My Wikimedia user page: User:WQL. You can contact me through email at me@qtxh.net. Wang_Qiliang added a comment to T221347: Investigate why a string literal changed in opcache (Fatal exception of type "ConfigException"). Wang_Qiliang created T219745: Checking contributions on mobile and shows error when usernames containing Japanese chracters. Wang_Qiliang created T219702: Database query errors occurring when importing. Wang_Qiliang closed T214946: Set $wgArticleCountMethod='any' in zhwikiversity as Resolved. Wang_Qiliang added a comment to T214695: Can't run InternetArchiveBot in zhwp. Wang_Qiliang added a comment to T216862: Chinese Wikipedia users cannot use IAbot. Wang_Qiliang created T216862: Chinese Wikipedia users cannot use IAbot. Wang_Qiliang awarded T212919: Adding transwiki source, Adding ailias to namespaces and creating "Experiment" and "Lesson" namespaces in Chinese Wikiversity a Like token. Wang_Qiliang closed T212919: Adding transwiki source, Adding ailias to namespaces and creating "Experiment" and "Lesson" namespaces in Chinese Wikiversity as Resolved. Wang_Qiliang added a comment to T212919: Adding transwiki source, Adding ailias to namespaces and creating "Experiment" and "Lesson" namespaces in Chinese Wikiversity. Wang_Qiliang added a comment to T210364: Enable the blocking feature of AbuseFilter on zhwiki. Err, sorry for interruption, but what about the consensus? Wang_Qiliang created T214881: Page cannot be marked as patrolled if moved from User: namespace to Main namespace. Wang_Qiliang updated the task description for T213938: When watching specific kinds of history on mobile devices, it returns a fatal error. .
Wang_Qiliang created T213938: When watching specific kinds of history on mobile devices, it returns a fatal error. .
@RazeSoldier Thanks and I will check it then. Wang_Qiliang updated subscribers of T212919: Adding transwiki source, Adding ailias to namespaces and creating "Experiment" and "Lesson" namespaces in Chinese Wikiversity. @RazeSoldier @Framawiki I am just wonder what is going on with the patch, since the result of the code review is -2. For namespaces 106 and 108 include research contents, $wgContentNamespaces should be modified at the same time. Wang_Qiliang created T212919: Adding transwiki source, Adding ailias to namespaces and creating "Experiment" and "Lesson" namespaces in Chinese Wikiversity. Wang_Qiliang added a comment to T212619: HTTP 500 error: xtools.wmflabs.org is currently unable to handle this request.. Unfortunately, it just returned a HTTP 500 error, which could be confusing. Wang_Qiliang awarded T30856: Remove classic edit toolbar from core a Dislike token. Wang_Qiliang added a comment to T202796: "Search within pages" message doesn't show in zh-hk, zh-tw and zh-mo UI lang on zhwiki. Can any intetface admins fix it by customizing the interface text? Wang_Qiliang updated subscribers of T202127: Change the default logo of Chinese Wikiversity. Wang_Qiliang added a comment to T202127: Change the default logo of Chinese Wikiversity. Moved to User-Urbanecm. I sincerely request @Urbanecm to schedule this patch for SWAT. Wang_Qiliang moved T201089: Do not add/remove spaces in citation templates in cswiki from Backlog to To deploy - SWAT necessary on the User-Urbanecm board. Wang_Qiliang moved T201624: Explore Growth team intervention list for Czech Wikipedia from Backlog to To deploy - SWAT necessary on the User-Urbanecm board. Wang_Qiliang moved T202127: Change the default logo of Chinese Wikiversity from Backlog to To deploy - SWAT necessary on the User-Urbanecm board. Wang_Qiliang added a project to T202127: Change the default logo of Chinese Wikiversity: User-Urbanecm. @RazeSoldier I have no time in next 5 days. I consider @A2093064 might help. Also, I only updated logos, hence the low possibility of errors occuring. Wang_Qiliang updated the task description for T202127: Change the default logo of Chinese Wikiversity. Wang_Qiliang created T202127: Change the default logo of Chinese Wikiversity. Wang_Qiliang awarded T199577: Create Wikiversity Chinese a Like token. Wang_Qiliang added a comment to T198371: All "zh-my" variant page views get 404 Not Found on zh.wikipedia.org. 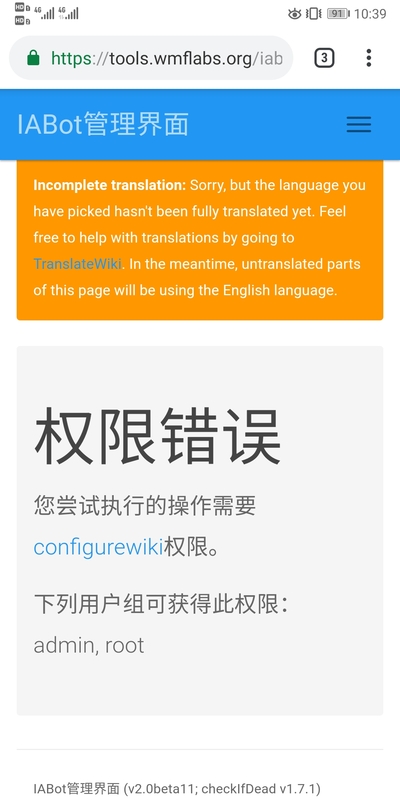 Wang_Qiliang added a comment to T193983: Enable zh-my language localization at the Chinese Wikipedia. So, as consensus exists, please enable the varient zh-my as soon as possible. Wang_Qiliang added a comment to T191588: Change the Chinese Wikipedia logo. The reason behind this is that these two are "margined", and align better with the current logo slot. Since this milestone logo is slightly taller, we need to pull the side nav bar down by 20px for all the skins that has a logo. Check out this tool I wrote for all the css that needs to be changed. Applicable for all the user languages and skins. The logo file can be set only one, it can't be changed by the language of interface. Only CSS Hacking is the solution. @Cwek Maybe. However, I think, if we hold it on until the creation of one Million article, would it be too late? Wang_Qiliang added a member for Chinese-Sites: Wang_Qiliang. Wang_Qiliang updated the task description for T179503: Deploy Timeless to zhwp. Wang_Qiliang created T179503: Deploy Timeless to zhwp.